East Journal of Translation (hereafter “EJT”), sponsored by Shanghai Federation of Literary and Art Circles, is a bi-monthly journal edited and published by Shanghai Translators Association and Graduate Institute of Interpretation and Translation, Shanghai International Studies University, devoted to academic discussions on interpreting and translation, the first of its kind featuring specialized Chinese-English bilingual, color-printed publication. “Global Vision and Exchange” as its principle and purpose, EJT has collaborated and communicated well with major international T/I institutions (e.g. CIUTI, AIIC, FIT)as well as international organizations including the UN, IMF, WB and EU. 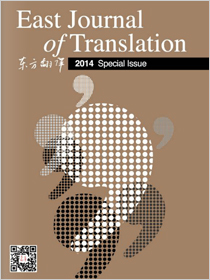 Since its pilot edition in August, 2009, more than 30 issues have been published, with each edition carrying 15-20 papers, and its subject matter ranging from domestic/overseas academic research on translation and interpretation, to the introduction of latest progress in T&I training and professional development. EJT attaches a lot of importance to the humanistic, intellectual and informational nature of its articles while ensuring that they are engaging to the readers. There are columns devoted to academic discussions such as “Research and Teaching”, “Translation Studies” on latest trends in and outside China, as well as ideas about cultivating professional translators and interpreters. Other columns on history of translation include historical accounts, anecdotes about translators and their work, and how writers relate to translation, with a view to sorting out and recording historical as well as contemporary literature by/of translators, to complement the long translation history and theoretical exploration. “Horizon of Culture”, a column on cultural studies, is also put in place to reflect the unique role that translation plays in cultural exchange, another perspective on the role of translation in international cultural communication.